We've teamed up with Mentholatum, specialists in pain relief heat and freeze products, to bring you this helpful guide on helping your patients manage osteoarthritis. We hope you find their information useful and beneficial to your customers. WANT TO HELP YOUR CUSTOMERS MANAGE THEIR OSTEOARTHRITIS IN FOUR SIMPLE STEPS? Around one third of people aged 45 and over in the UK have sought treatment for osteoarthritis (OA). That is a total of 8.75 million1, making OA the most common musculoskeletal condition in older people. Joints become inflamed as cartilage deteriorates and the result is stiffness, pain and loss of mobility or dexterity. The more severe the case, the greater the impact OA will have on the sufferer’s work, home and leisure time. Between 1990 and 2010, disability due to osteoarthritis in the UK increased by 16%² This upward trend is expected to continue, as osteoarthritis is more common in those over 50 and the obese and numbers within these groups are set to rise³. When movement is painful, people are understandably reluctant, even frightened to try to keep moving, but the latest advice from expert bodies such as NICE4 recommends them to do their best to strengthen the muscles involved and to make general fitness part of their lifestyle. Mentholatum understand what it feels like to suffer from osteoarthritis, they also know there is no magic pill to cure it. So they have developed a four-step, easy to follow self-management programme which we encourage you to recommend to your OA customers to help them get on with their life. You WANT to help your customers and they WANT to feel more in control of their condition – these four simple steps can be taken at the customer’s own pace and in their own time. 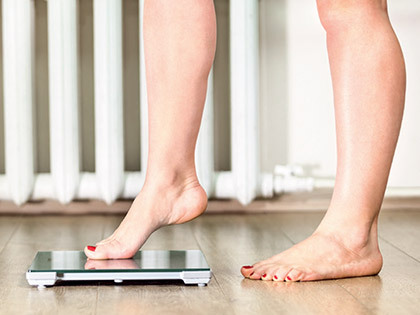 Every pound of excess weight exerts about four pounds of extra pressure on the knees5, so the less extra weight we are carrying, the easier it is to move and less pressure on the joints can mean less pain. Managing body weight will help improve the quality of life of osteoarthritis sufferers, but it is not easy to lose weight, especially when mobility is affected and going for a run or a workout in the gym are simply not an option. Find out more about the recommended type of exercise in the Activity section below. As always, people who are looking into losing weight should be advised to check with their GP that it is safe for them to do so. Most OA sufferers will understandably fear that their joints will become even more painful with exercise and movement. As a health professional, you are in the ideal position to reassure them about what it is normal to experience in the first 10 minutes of exercising and help them understand that movement will become easier as circulation increases and the joints start to lubricate themselves. Choose a weight bearing activity such as walking - starting with short walks, slowly building up each week as muscles and joints get stronger. 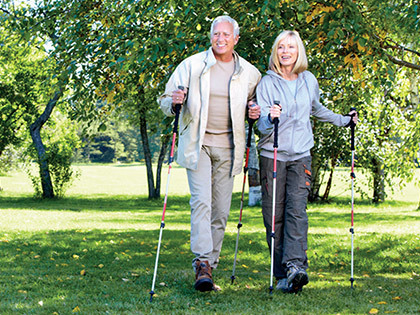 Investing in shock absorbing footwear and a set of walking poles will help customers get started. When OA affects the hands, fingers can be encouraged to move with simple exercises using a stress ball or other small, soft ball. The food we eat can affect our joints, some foods worsening inflammation and others helping to calm it. It is important for customers to exercise some control over their condition and do a little research into nutrition to identify the ‘good’ and ‘bad’ foods for OA sufferers. And tell them to listen to their bodies – we all know what happens when we have eaten something we really enjoy, but which might not agree with us! 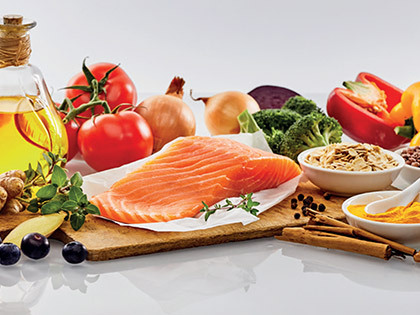 The Mediterranean diet is often praised for helping maintain a healthy weight – it varies from country to country, but in general, it is high in vegetables, fruits, legumes, nuts, beans, cereals, grains, fish, unsaturated fats such as olive oil and it usually has a low intake of meat and dairy foods. Some Food supplements - containing Hyaluronic Acid (HA), fish oils or long chain omega-3 fatty acids such as ETA, DHA, EPA, might also be helpful, but food supplements should never be used as a substitute for a varied, balanced diet and healthy lifestyle. The use of topical hot or cold therapy can be considered. Heating products, used before exercise, can help ease tight, stiff joints, while cooling products, used after exercise, can help calm heat and soothe the joints. Topical Non Steroidal Anti-Inflammatory products such as anti-inflammatory cooling gels can help cool and soothe joints and reduce the pain and inflammation. Many customers find the number of topical pain relief products available a little daunting, so they will appreciate help in selecting the suitable products to care for their joints efficiently. 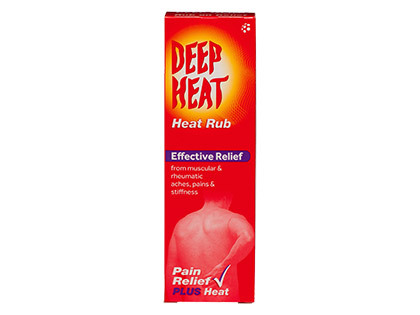 Mentholatum is the UK’s number one seller6 of topical hot and cold pain relief products7 including the iconic Deep Heat, Deep Freeze and Deep Relief, its topical NSAID brand. The mix of formats across the ranges and the fact that some of the products are drug-free means that your customers will be able to find something suitable for their individual needs. Heat helps to soothe muscle aches and pains. Our Deep Heat Muscle Massage Roll-on Lotion8 helps soften tight muscles to restore movement. Deep Heat Pain Relief Heat Patch provides long lasting, odourless pain relief. The increased blood flow helps aid the healing process. Cold therapy works fast. 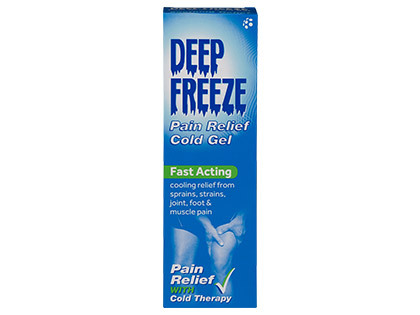 Our Deep Freeze range of products provide fast pain relief for joint pain. 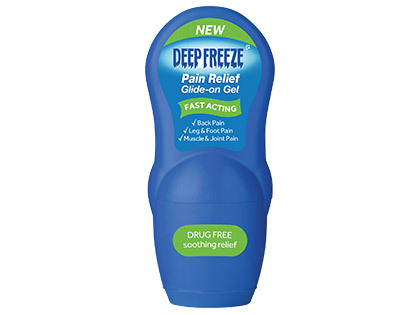 The cooling effect of the Deep Freeze Pain Relief Cold Gel, Patch and Glide-on Gel have been scientifically proven to penetrate soft tissue to a depth of 3cm. Topical anti-inflammatories provide targeted, penetrating pain relief for inflammatory joint and muscle pain. Deep Relief Anti-Inflammatory Gel is recommended for the effective relief from back pain, rheumatic pain, muscular aches, pains and swellings such as strains and sprains. Deep Relief Joint Pain Gel is also suitable for the relief from pain associated with non-serious arthritic conditions. References: 1 Osteoarthritis in general practice July 2013 Arthritis Research UK PDF 421 MB.pdf. 2 Murray C et al. (2013). UK health performance: findings of the Global Burden of Disease Study 2010, Lancet 381 (9871), 970-972. 3 Government Office for Science (October 2007). FORESIGHT Tackling obesities: Future choices – project report, 2nd Edition 4 https://www.nice.org.uk/guidance/cg177/chapter/1-Recommendations 5 https://www.arthritis.org/living-with-arthritis/comorbidities/obesity-arthritis/fat-and-arthritis.php 6 IRI sales data in units, 52 weeks ending 29th December 2018. 7 Deep Heat Pain Relief Heat Patches, Deep Freeze Pain Relief Cold Patch and Deep Freeze Pain Relief Glide-on Gel are medical devices. 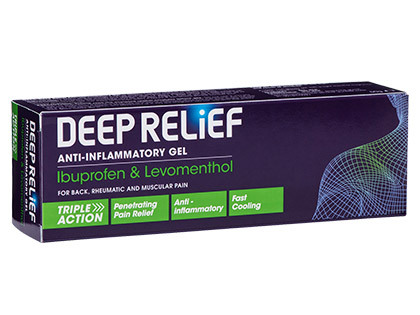 Deep Relief Anti-Inflammatory Gel/Deep Relief Joint Pain Gel Product Information Presentation: Gel containing ibuprofen 5.0%w/w, levomenthol 3.0%w/w. Uses: Relief of rheumatic pain, muscular aches, pains and swellings such as strains, sprains and sports injuries. [Also for the relief of the pain associated with non-serious arthritic conditions – Deep Relief Joint Pain Gel 100g Pharmacy only]. Contraindications: Those patients known to be hypersensitive to ibuprofen, levomenthol, or any of the ingredients or sensitive to aspirin, or other NSAIDS including when taken by mouth, or asthmatic patients in whom aspirin or non-steroidal anti-inflammatories are known to precipitate asthmatic attacks, rhinitis or urticaria. Use on broken skin or denuded skin. Simultaneous use on the same site with any other topical medicine. Use in the presence of local infection. Use in the last trimester of pregnancy. Method of use: Adults and children over 12 years - apply gel with gentle massage to the affected area, up to a maximum of three times a day. Not to be repeated more frequently than every four hours. Precautions: For external use only. Always try on a small area first. The gel should not be used on or near mucous membranes, nor near the eyes. Avoid contact with inflamed or broken skin. Discontinue use if rash or irritation develops. Not for use with occlusive dressings. As it is known that oral Ibuprofen may worsen an existing renal impairment, or aggravate an active peptic ulcer, patients with a history of renal problems or with an active peptic ulcer should seek medical advice before using topical Ibuprofen products. Wash hands after use unless they are being treated. If anyone swallows the gel he or she should contact his or her doctor or nearest casualty department. By extrapolation from other routes of administration: although this is less likely with NSAIDs intended for topical use compared to oral drugs, the use of these products, as with any drug known to inhibit cyclo-oxygenase/prostaglandin synthesis, may impair fertility. In women who have difficulty conceiving or who are undergoing investigation of infertility, withdrawal of these products should be considered. Consult doctor if patient experiences any unwanted effects, if there is no improvement, or the condition is aggravated. Concurrent use of aspirin or other NSAIDS may result in an increased incidence of adverse reactions. Pregnancy and lactation: Topical ibuprofen is not recommended during the first six months of pregnancy and is contraindicated in the last trimester of pregnancy. Lactation – not recommended. Side effects: Skin disorders are most frequently reported: Application site reactions such as, rashes, pruritus and urticaria, drying, reddening, burning sensation, contact dermatitis. Application site burns have been reported for menthol-containing products. Frequency unknown. Although extremely uncommon when administered topically side effects such as abdominal pain, dyspepsia and renal impairment are possible. Hypersensitivity reactions have been reported following treatment with ibuprofen. These may consist of (a) non-specific allergic reactions and anaphylaxis (b) respiratory tract reactivity comprising of asthma, aggravated asthma, dyspnoea and bronchospasm which may be precipitated in patients suffering from or with a previous history of bronchial asthma or allergic disease (c) assorted skin disorders, including rashes of various types, pruritus, urticaria, purpura, angioedema and, less commonly, bullous dermatoses (including epidermal necrolysis and erythema multiforme). Adverse events should be reported. Reporting forms and information can be found at www.yellowcard.gov.uk . Legal category: Deep Relief Anti-Inflammatory Gel in 15, 30, 50 and 100g GSL; and Deep Relief Joint Pain Gel in 100g P. RRP (ex-VAT): 30g GSL £3.99, 50g GSL £4.99, 100g GSL £9.17, 100g P £9.17. Marketing Authorisation Holder: The Mentholatum Company Limited, 1 Redwood Avenue, Peel Park Campus, East Kilbride, G74 5PE. MA number: PL 00189/0027 Deep Relief Anti-Inflammatory Gel / PL 00189/0036 Deep Relief Joint Pain Gel. Date of preparation: November 2018. 8 Deep Heat Muscle Massage Roll-on Lotion is a non-medicinal product to help ease tight muscles.